The King of Darts was born here in Forest Gate. Description: This is where darts legend Bobby George was born above a garage on 16th December 1945. He didnt take up darts until he was 29, and won many titles but not the world championship. 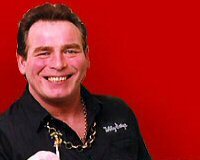 He is famous for his colourful entrances as The King of Darts and his excessive jewellry!